Perhaps it’s appropriate, but The Room (Free), the original one, is one of those games where it’s hard to take it apart piece by piece and find what exactly makes it so great. Like a real puzzle box, it’s almost impossible not to sit there fiddling around with the box, pulling at its many bits and pieces. Its limited scope, with just a big box sitting on a table, means that it isn’t too hard to make progress as long as you kept trying things, and if you do manage to get stuck, the game has a really well-designed hint system. You keep moving forward, and feeling pretty clever most of the time. The story sits firmly in the background for most of the game, with little details you can pay attention to or ignore as you like. Whether or not you pay attention to the narrative, the atmosphere is hard to resist. As you keep whittling down the puzzles, it’s hard not to wonder what kind of person makes a device like this. Fireproof Studios could have kept cranking out games with that kind of narrow, deep design. It certainly worked for Five Nights At Freddy’s ($2.99). Instead, The Room Two ($1.99) expands outward. While the original game could be more accurately described as The Box, the sequel has you solving puzzles that spread around the entire room. You have to solve this thing over here to get the piece you need to solve that puzzle over there. Rather than breaking chapters between certain sections of a larger puzzle, the follow-up has each chapter take place in a different room, each with its own ultimate solution. Not only does this allow for more complex puzzles, it also gives the game a lot more space to tell a story in, something it takes good advantage of. Again, you can take it or leave it, but it’s a lot harder to ignore this time around. Things are less abstract, so it’s easier to make a human connection. While the puzzles require a bit more lateral thinking, they’re still pretty linear in that you can’t really get too far ahead of yourself, and the hint system remains nearly perfect. I think the game lost a little something in giving up its focus, but it made up for that loss in plenty of other ways. Perhaps it’s not surprising, then, that The Room Three ($3.99) continues to expand. Instead of discrete, disconnected rooms, everything in this game is connected to a hub, itself composed of several interconnecting rooms. It allows itself a little room for abstraction by teleporting the player from the hub to each of the main puzzle areas, but even those areas are meant to be part of the game’s setting, a large castle. The hub has many mysteries of its own, and you’ll need to solve at least some of them to move forward. The main puzzle areas themselves are usually made up of at least a few rooms, each with their own little puzzles and points of interest. 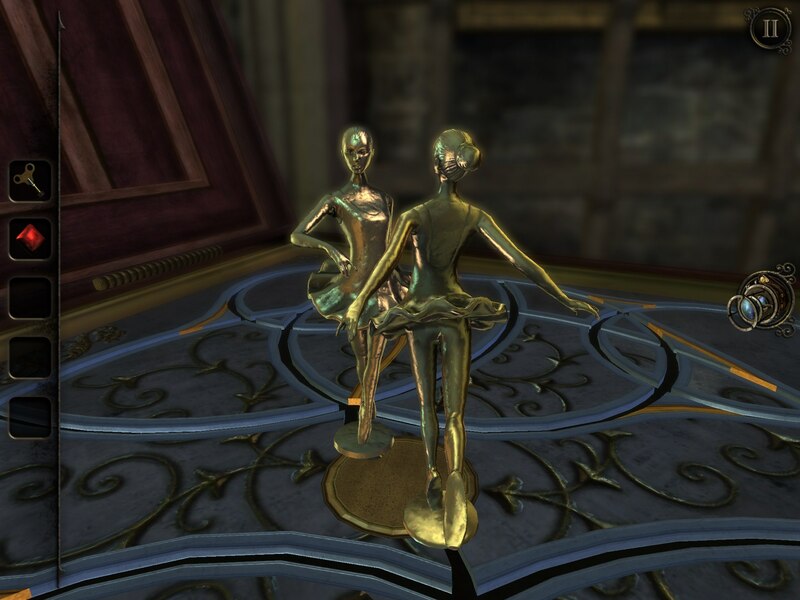 In short, The Room Three is less of a little puzzle box your fool around with in your hands and more of a full-blown adventure game in the vein of classics like Myst ($4.99). Those who enjoyed the way the puzzles were nested in the first game have also been heard, however. The new gimmick of your trusty eyepiece allows you travel inside of certain objects to solve additional puzzles within. It’s not quite the same feeling the first game gives you, but it accomplishes the goal of making you further question how much of the real picture you’re seeing when you look around the room. As you’d expect, the game has some fun with this concept at times, though I’m not about to spoil any of it. The downside of all of this spaciousness and complexity is that when you need to backtrack, it can take a bit of time. As in the other games, you don’t have free control of your character’s movement, instead getting around by tapping on doors and such. The game also wisely focuses your point of view on the main piece of each room, but the side-effect of that is that if you’re just passing through, you have to constantly snap the camera around to the exits. It’s a minor annoyance in the scheme of things, but it’s there. As the game is much bigger and longer than the previous titles, there are considerably more puzzles packed in than before. 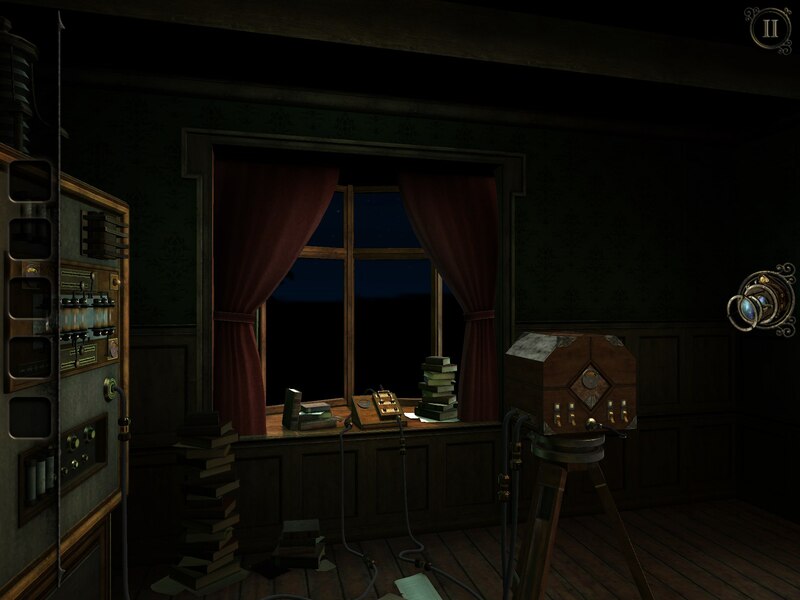 It’s a huge credit to the developer that most of the puzzles in The Room Three are quite good. They’re not too easy, but they also generally avoid being too esoteric in their solutions. Like in the previous games, it’s more about realizing what you can interact with and how, rather than having to chain together whatever odd jumps in logic the designer might have had in mind. The larger areas and increased number of separate pieces to figure out can sometimes make it trickier to find the thread you need to pull on compared to before, but it’s still just a matter of tracking down that thread and giving it a good yank to get things moving again. The game gets a little harder towards the end, and the optional mysteries certainly take some thorough digging, but it’s certainly quite manageable relative to other games in the genre. And as before, an intelligent hint system is available should you get stuck anywhere too long. That said, with as many puzzles in the game as there are, there were bound to be a few things that didn’t work as well. The hub features a couple of puzzle types that repeat enough to wear out their welcome, and there’s one section where you’re doing step-by-step navigation of a 3D maze that just felt utterly pointless to me. These are only a few minutes in an hours-long game, but they stand out simply because the rest of the game is so good. The story takes a heavier focus this time around, though it’s again mostly passive. The previous games couldn’t do much without an identifiable antagonist, something that is provided this time around in the form of the mysterious Craftsman. Along with the persistent location, the Craftsman’s presence helps the game string everything together in a cohesive way. This time around, there are multiple endings to be uncovered, giving the game an extra shot of replay value. No matter which ending you get, you’ll likely still have some questions, though. The previous game kind of wrapped things up neatly at its conclusion, but The Room Three opens everything right up once more, and reflects the events of the previous games in a new light. Of course, you can just ignore all of this if your interest lay solely with the mechanics, but the story is so much more interesting this time around that it’s worth paying attention to. While in some ways I can understand people who miss the cozy little puzzle box the first game offered, I think it’s truly impressive the way this series keeps taking big steps to shake things up. The Room Three, for better or for worse, is the biggest and most elaborate puzzle box Fireproof has designed yet. There’s an awful lot I won’t talk about for risk of spoiling the experience, but the developers have wrapped their game in yet another layer of depth, truly delivering on what the second game seemed to be reaching for. Sure, you can’t hold this box in your hands as well as you once could, but that doesn’t make it any less fun or satisfying to peel away its layers.